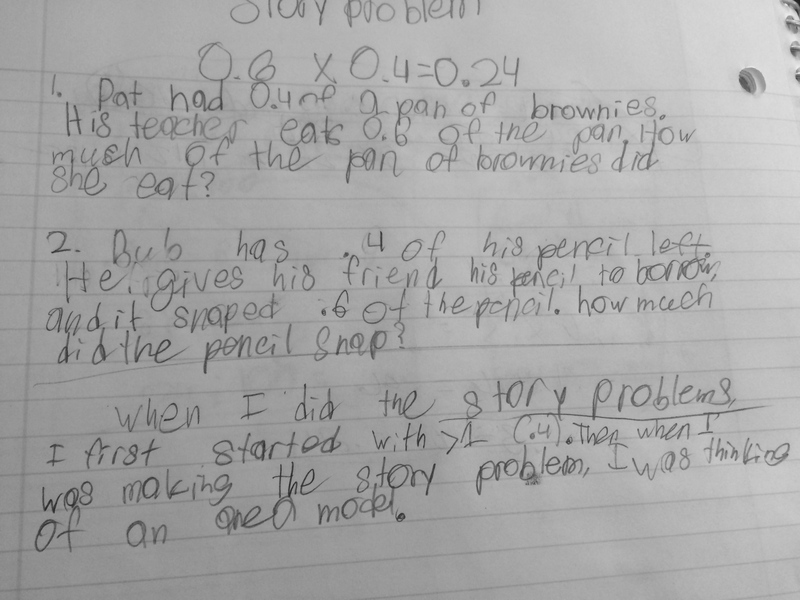 Early elementary spends SO much time building understanding of the relationships between 1’s, 10’s and 100’s, but I don’t think we do this standard justice as students build their understandings of fractions and decimals. 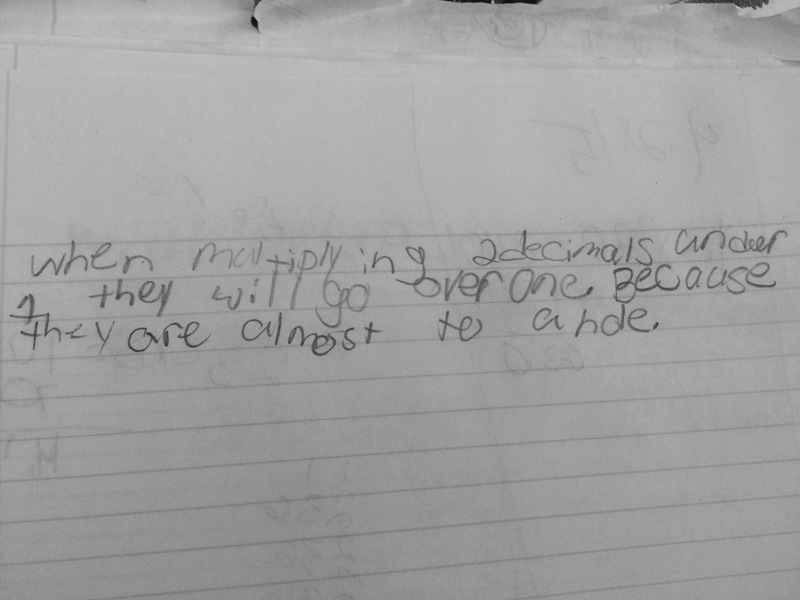 Leigh’s 5th grade math class just started their work with decimals. 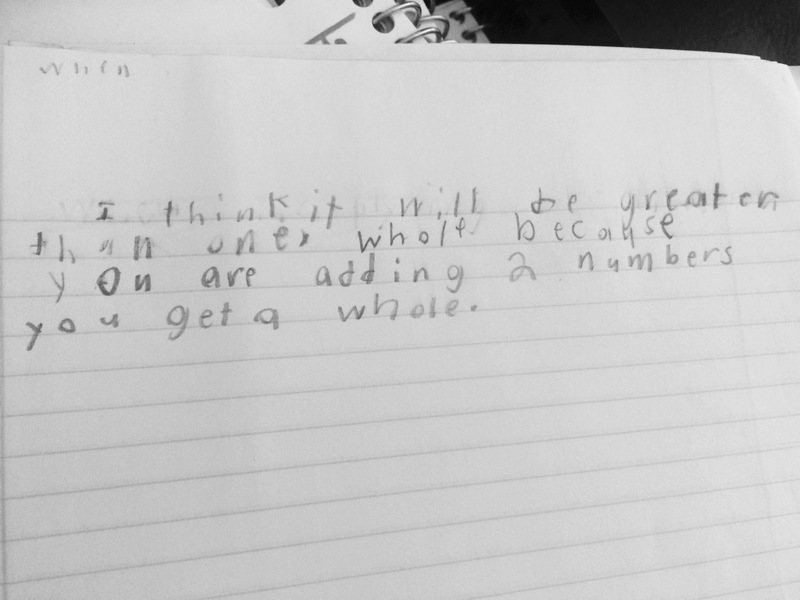 To help students make connections to what they learned last year, she and I went back and brushed up on where the students should be in terms of the 4th grade CCSS. 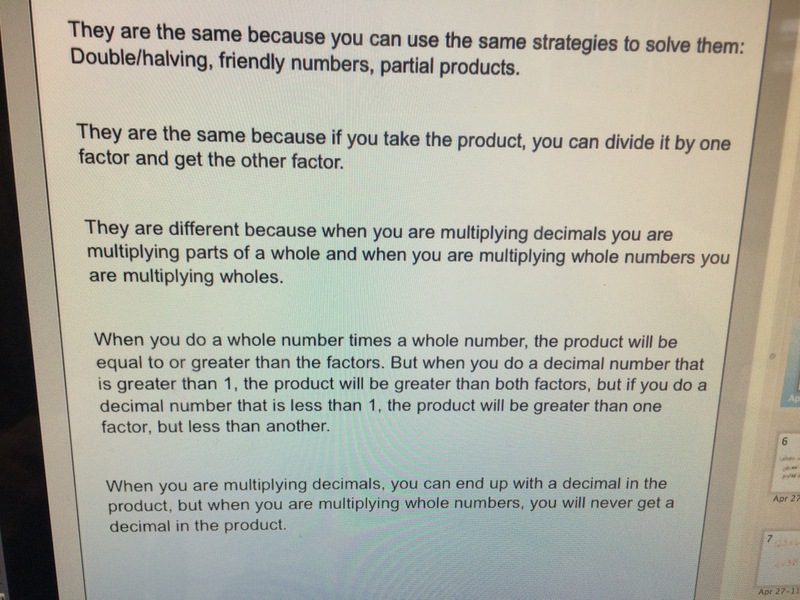 It is always so interesting to me how the CCSS authors chose to put decimals in the NF strand in 4th grade because students are learning decimals are just another way to write a fraction with a denominator of 10 or 100. Building on that understanding, the decimal work then moves to the NBT strand in 5th grade as students begin operating with them. Those are the little, thoughtful details in the standards that I really appreciate. 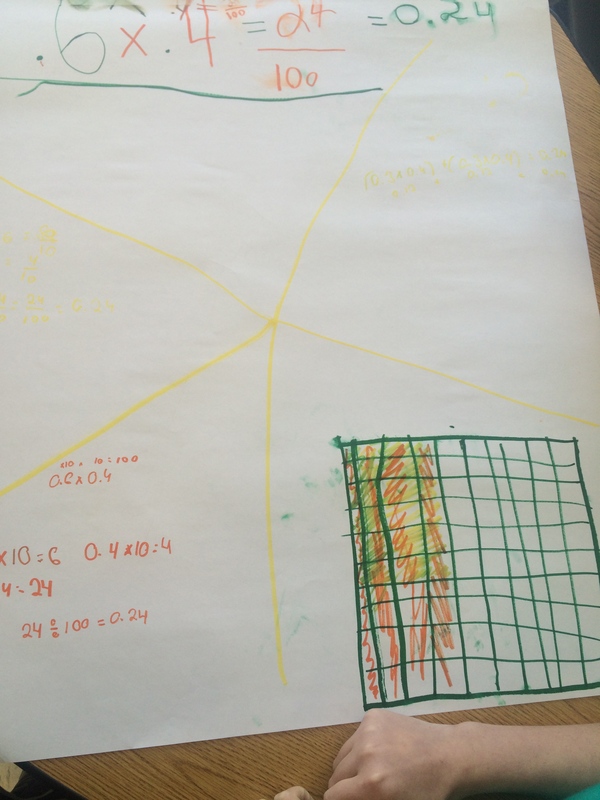 The first lesson or two of the unit, Leigh picked up where the students left off in the curriculum last year – shading 10 by 10 grids in a game called Fill Two. In this game, students only work with tenths and hundredths so in subsequent lessons she introduced thousandths on the same grid, with each small square now partitioned into 10 smaller pieces. 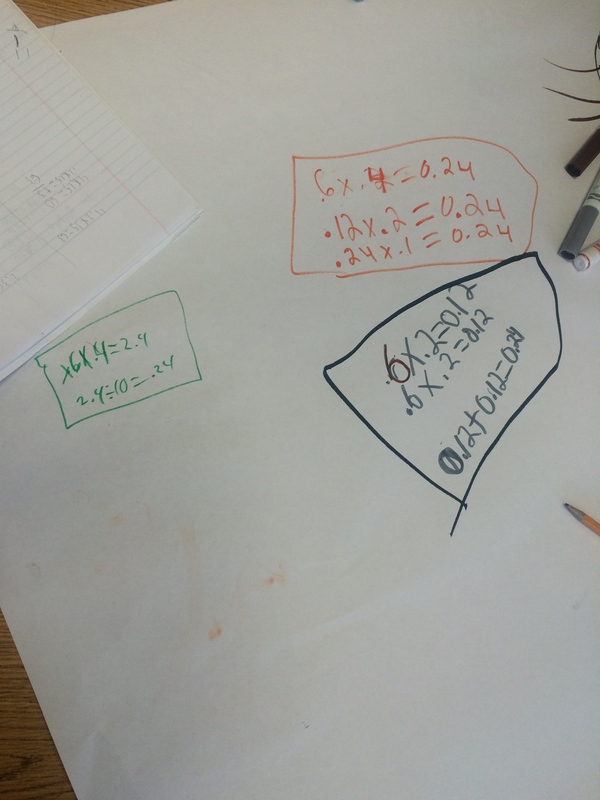 To be confident of the path we were on with decimals, Leigh and I met to revisit the CCSS. 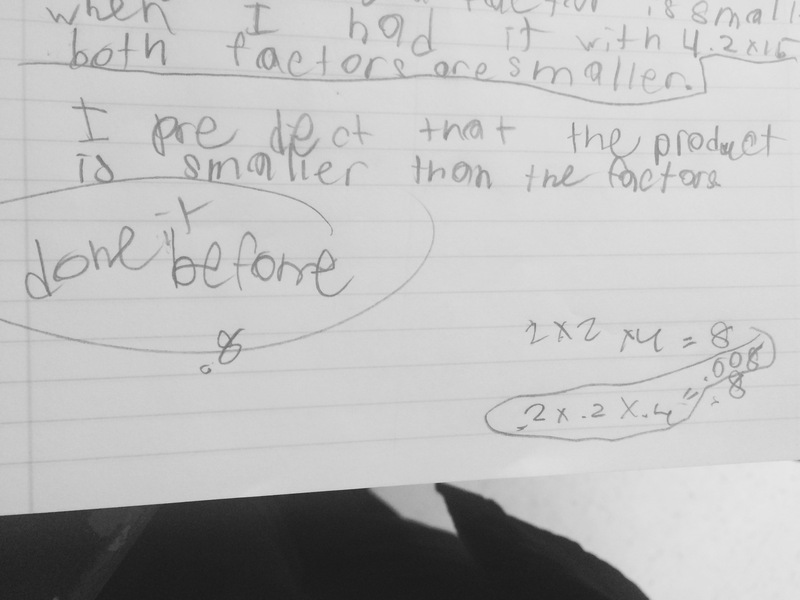 We both felt the students were doing 5.NBT.A.1 in a conceptual way, but we were never really making the understanding explicit with students. 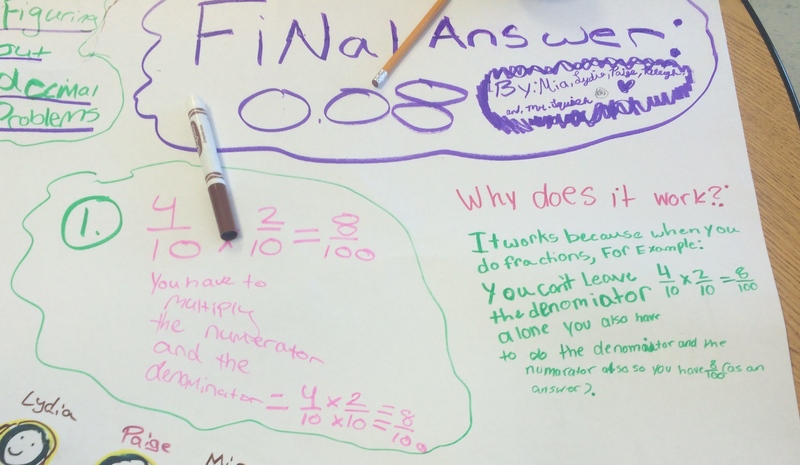 Since there wasn’t a great place in the curriculum for this, we went to Illustrative Mathematics, found this task and built a lesson around it. We opened the lesson with this Which One Doesn’t Belong? to see how students related the representations, in particular, how they talked about the picture since the task had something similar. They came up with some really interesting comparisons and everyone saw the picture of base 10 blocks as 0.12 and “not even close to 1,” which the others were. This is where I think the lack of attention we give the standard above is really apparent. I think students learn each small cube is 1/100, so each skinny tower is 1/10, but are never pushed to think about what other values they could represent…how quickly they forget K-2:). We then did a Notice/Wonder with the image from the task before they jumped in to work on the task prompt. They did a great job trying to get into Jossie’s head, so we let those ideas sit there as we gave them 3 minutes of individual work time to begin the full task. After time to work with a partner, we came back together to discuss Jossie’s reasoning and the different values the picture could represent. As we anticipated, many of the students said the Jossie got the tenths and hundredths pieces confused. So polite in her disagreement, I love it! 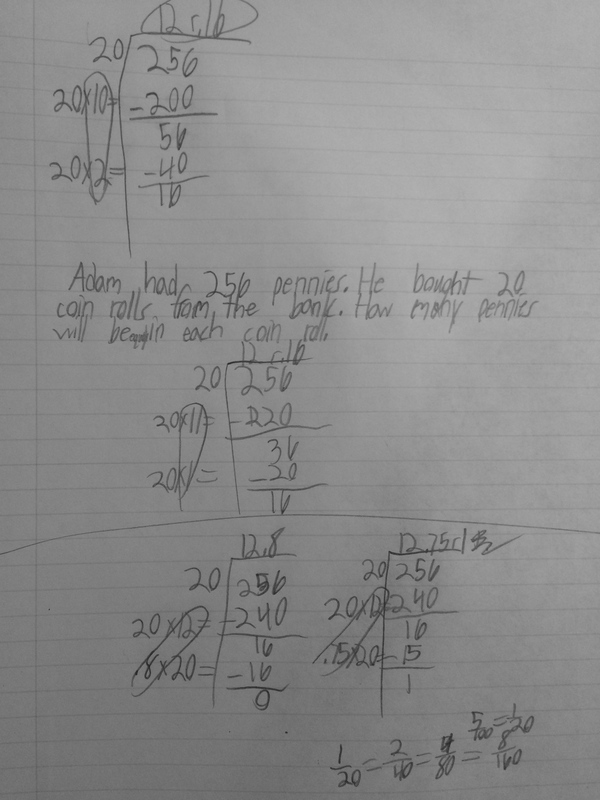 After her explanation, I asked the rest of the class what they thought about how tens and hundreds are related versus tenths and hundredths. 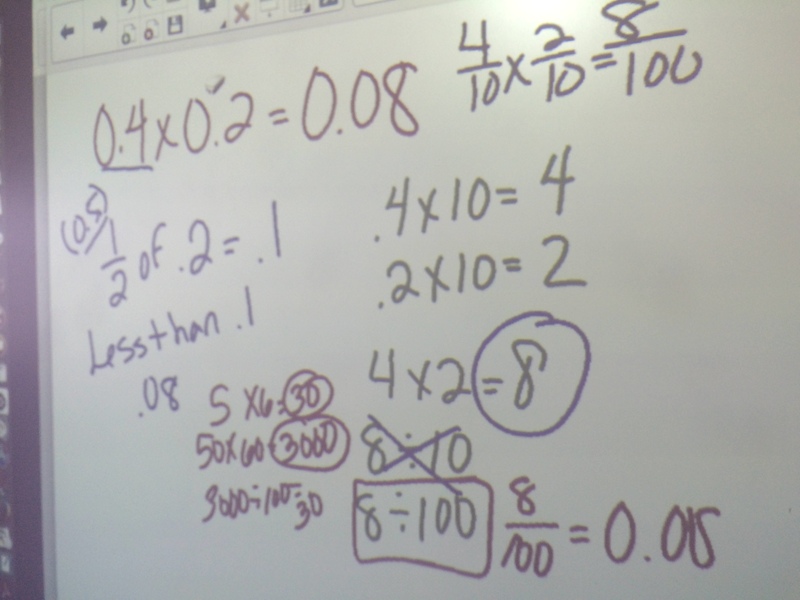 It was a great discussion of how tens build to hundreds but hundredths build to tenths. 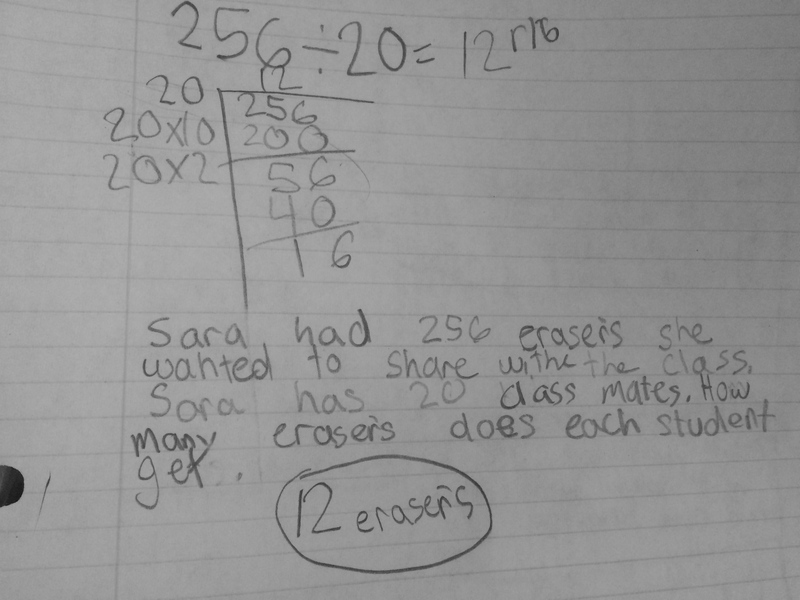 My summary here doesn’t do a bit of justice to how the students were talking about the math. I collected their possible values for the picture and recorded them on the board. 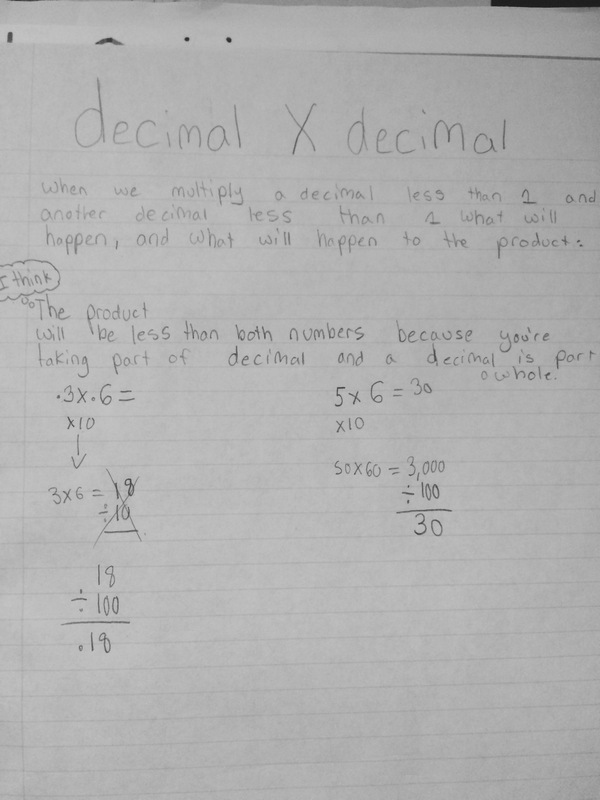 This entry was posted in 5th Grade, Decimals, Place Value, Uncategorized on March 13, 2017 by mathmindsblog. 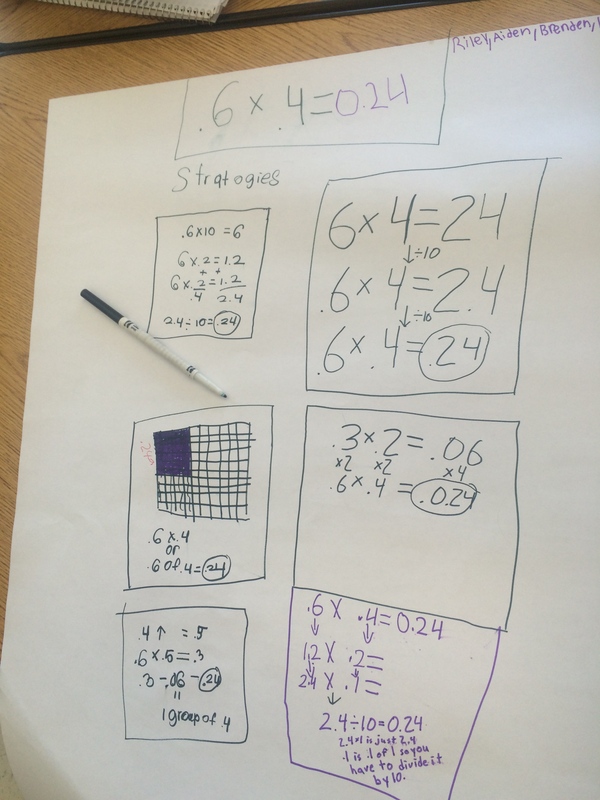 When solving problems in Number Talks, the strategies, en route to the solution, are the focus of the discussion. However, not all problems posed during a Number Talk are created equal or solved the same way every time by every student. While I know the majority of students use a particular strategy for one reason or another, whether it be because of the numbers involved or maybe it is the only strategy they are comfortable using, I like to take time and make these choices explicit. I want the students to think about the numbers before just computing and become more metacognitive about their actions. Last week, the 5th grade teachers and I planned for a card sort to get at just this. The students have been adding decimals and using some great strategies, but we really wanted to hear about the choices they were making. With the help of the Making Number Talks Matter book, we chose problem types for students to think relationally between whole number and decimal operations. While there are no right or wrong answers, these are the cards developed by 5th grade teacher, Eric, and some strategies we thought went along with each. 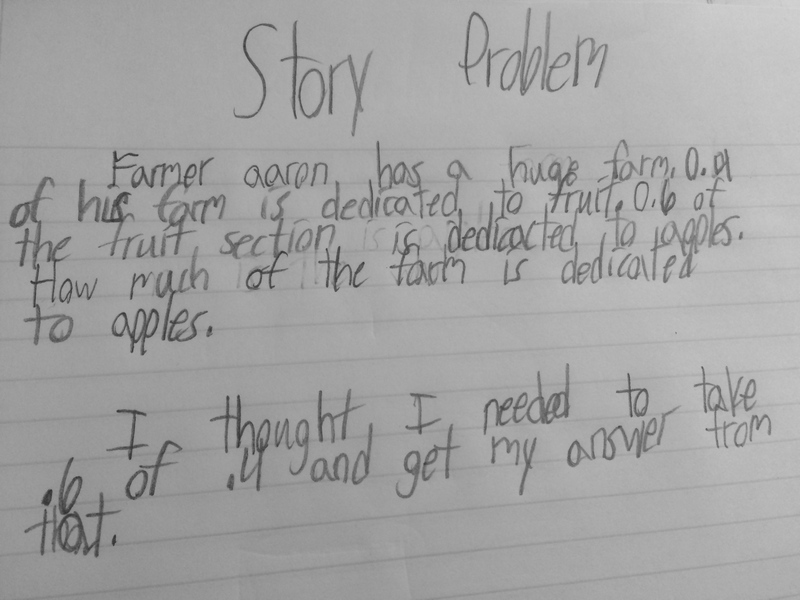 The expectation was not to have the students solving it the way we had listed, but to hear, and have other students hear, the choices being made. While the card sort conversations were really interesting, the class discussion afterwards was amazing! There were so much questioning of one another about how one strategy is any different than another. For example, some groups used rounding for a problem that another group used compensation and another grouped called it using friendly numbers…so groups had the same problem in three differently-named categories. 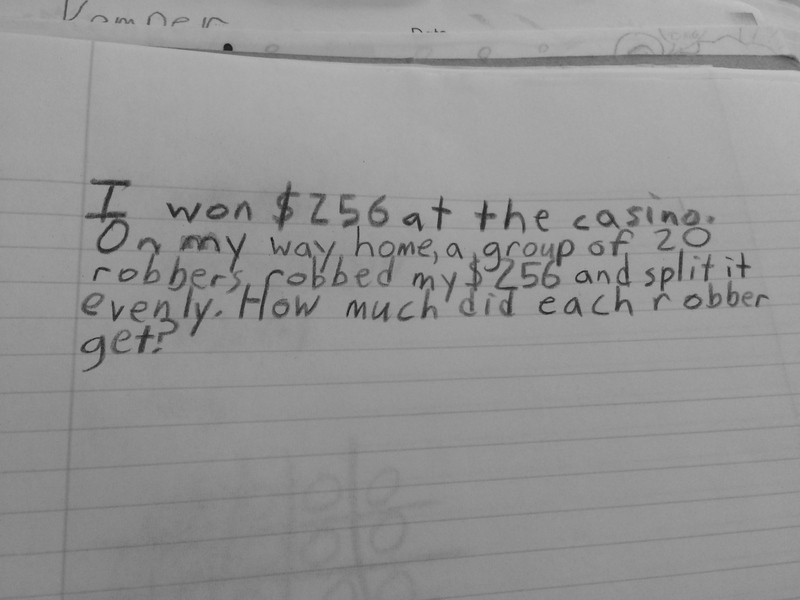 Again, the category was not important, but more the fact they were actually thinking about the numbers they were given. 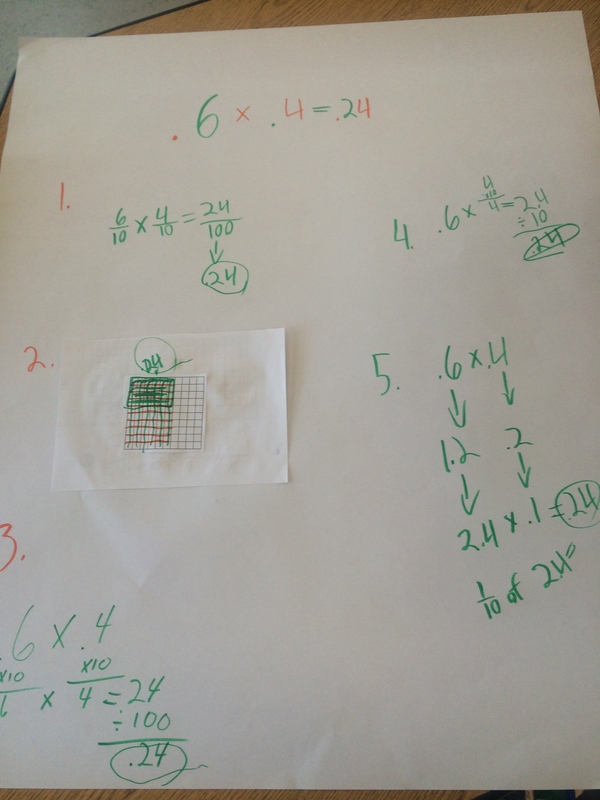 The other 5th grade teacher and I are planning to do the same activity with multiplication when they get there! Excited! 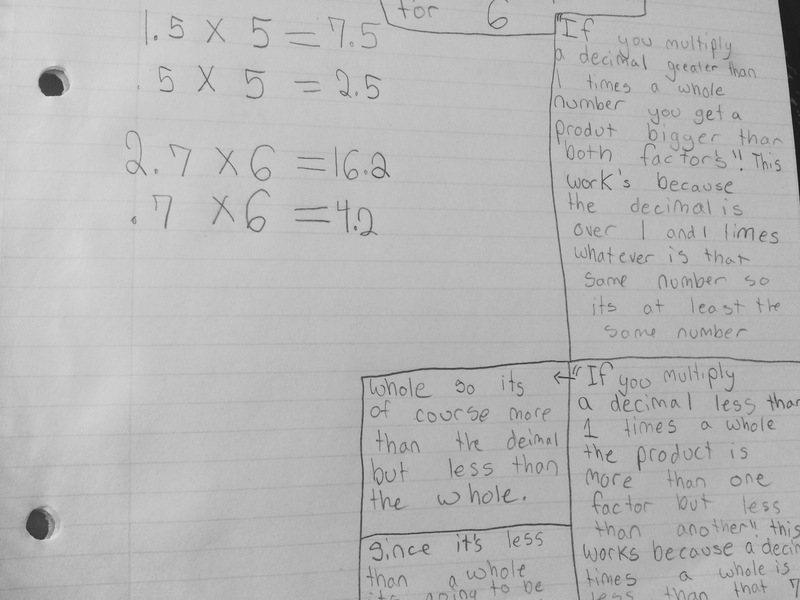 This entry was posted in 5th Grade, Addition, Decimals, Uncategorized on March 7, 2016 by mathmindsblog. Looking ahead in planning for the remainder of the school year, I am currently finishing up my decimal unit and excited to end the year with Growth Patterns. 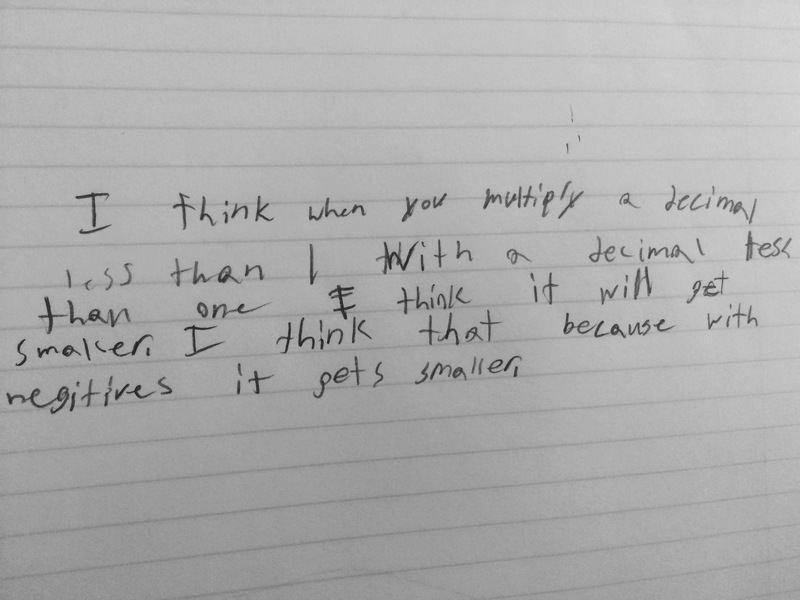 I was planning on finishing decimals this week, however, I have one more thing that I feel is missing from the unit that I am curious to see how students are thinking around it. 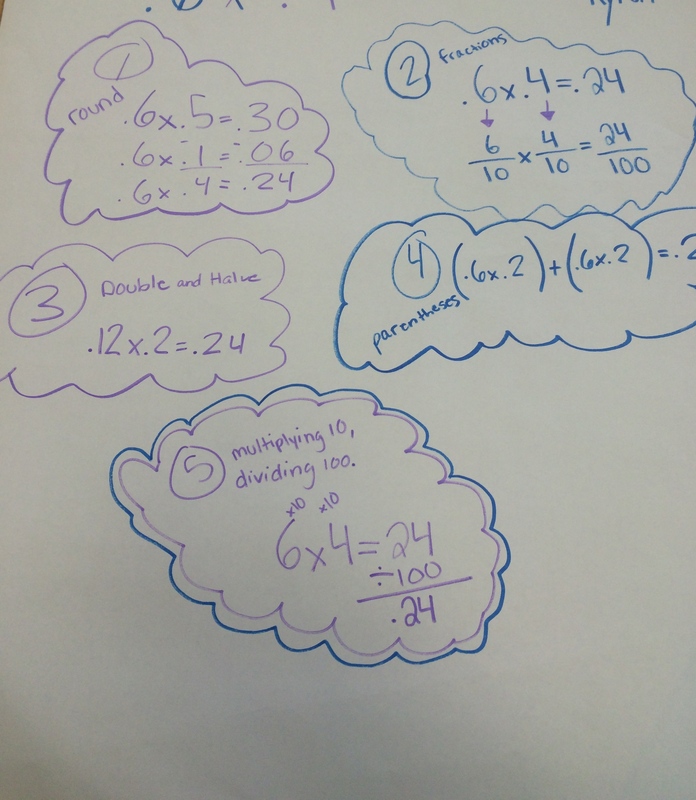 In the unit, within decimal division, the students are very comfortable estimating quotients and thinking about a variety of strategies in finding how many of the divisor are in the dividend. However, one thing that is not addressed is remainders, and how we notate them. I had not really thought much about it because in the context of the problems we were doing, the remainder made sense. 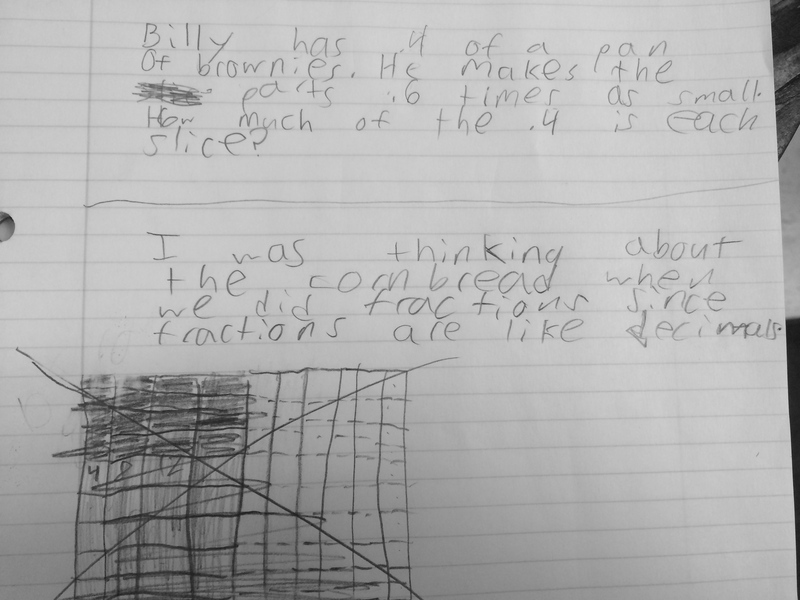 However, during a division number talk, not within a context, the “r” was still there. It bothered me a bit. When I asked how they could write the quotient as a number, I got blank stares. 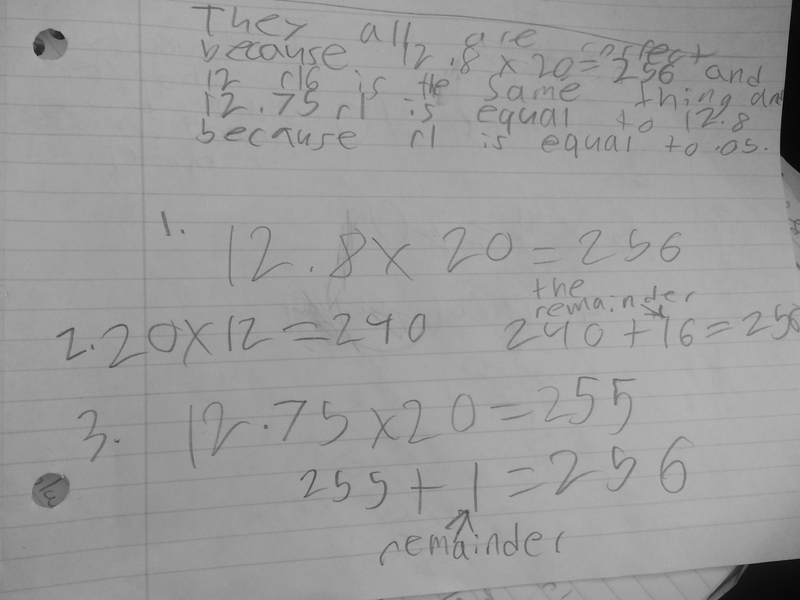 I know fourth grade really spends a lot of time on interpreting remainders, but do we spend equal time on various notations of the quotient? 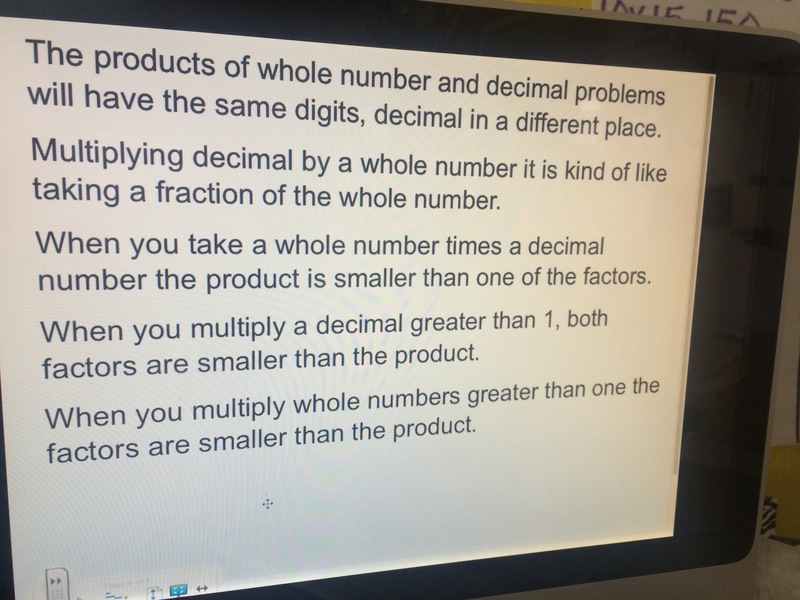 I have decided to extend my decimal unit just a bit longer because I feel this is something my students can definitely reason about and I am curious the connections they can make between whole numbers, fractions, and decimals. 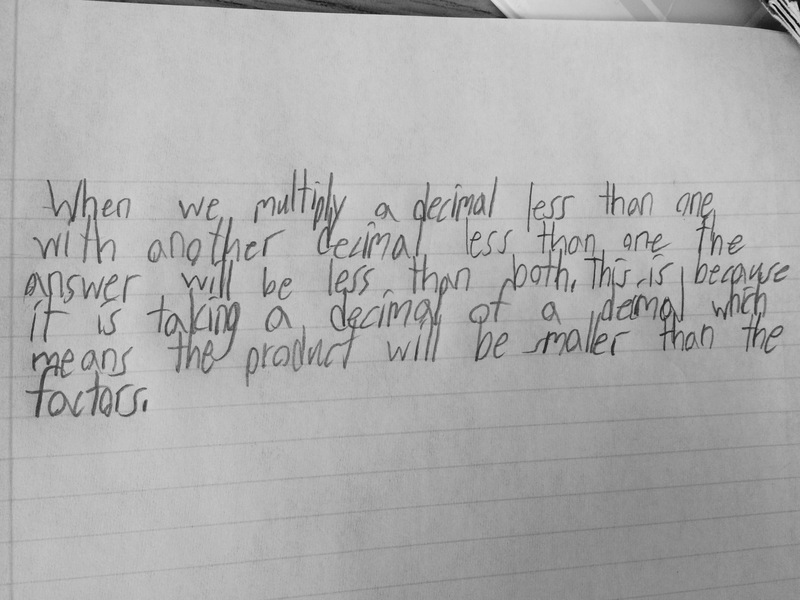 I decided to start with whole number divisors and dividends and move to decimals from there. 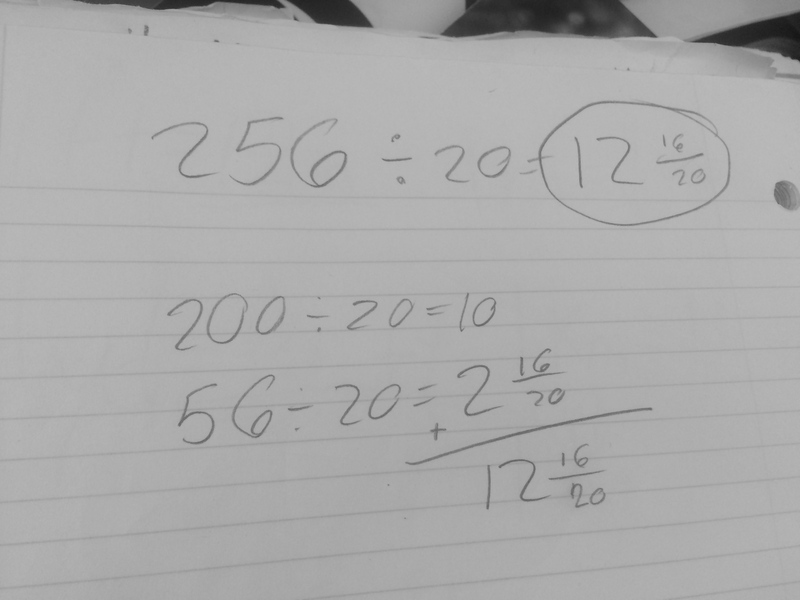 Today, I gave them the problem 256 ÷ 20. 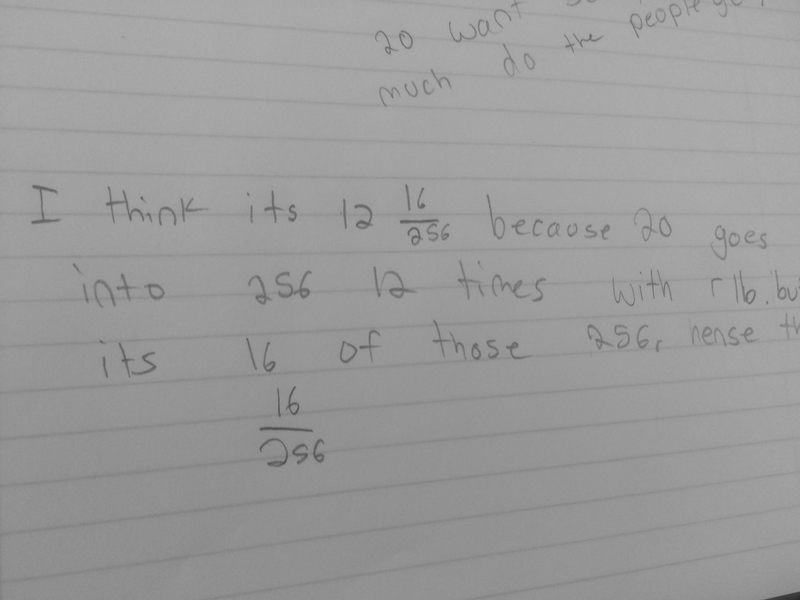 They estimated somewhere just over ten and then I asked them to solve it. If they finished early, I asked them to write a context to match the problem. I wrote these responses on the board and asked the students to see if any of the answers meant the same as 12.8 or 12 16/20 or 12 r 16, that we had established were the same. They did also mention, which I loved, that certain situations my use different notations. 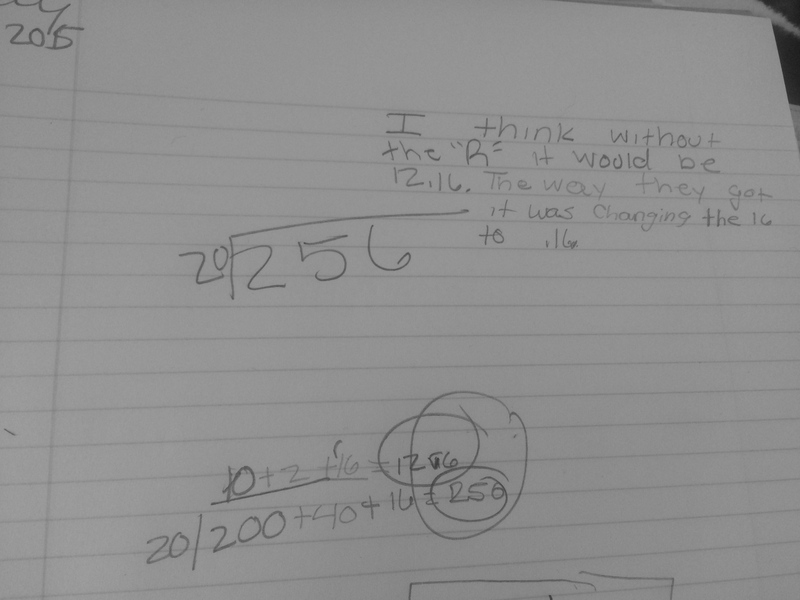 I had some amazing proofs that we are kicking off the day with tomorrow before moving into decimal divisors. 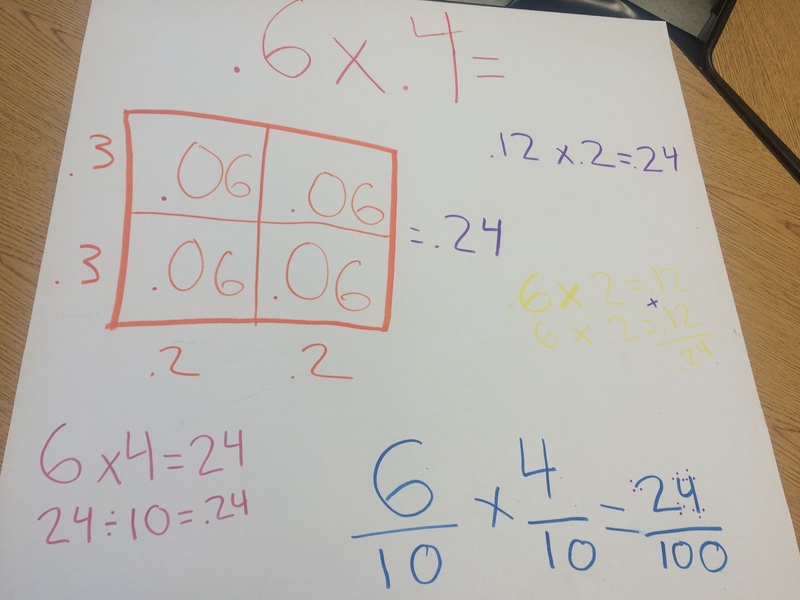 While I was hoping for students to look for equivalencies in the quotients themselves, most groups went back to trying out division in a different way to prove the answers. This group went back and solved the problem using the same method every time, just changing the breakdown of the quotient. 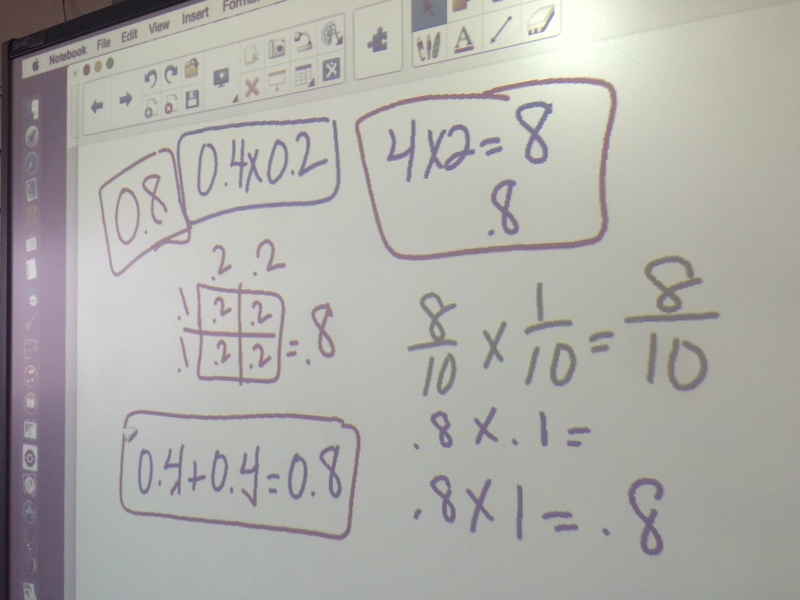 This group used multiplying up to see that 12.5 r 6 worked as a correct answer. This student is still sticking with 12 16/256 and quite honestly I don’t know how to approach this one. It is a different way of writing the remainder and I cannot decide if there is a time when this would be an appropriate notation? 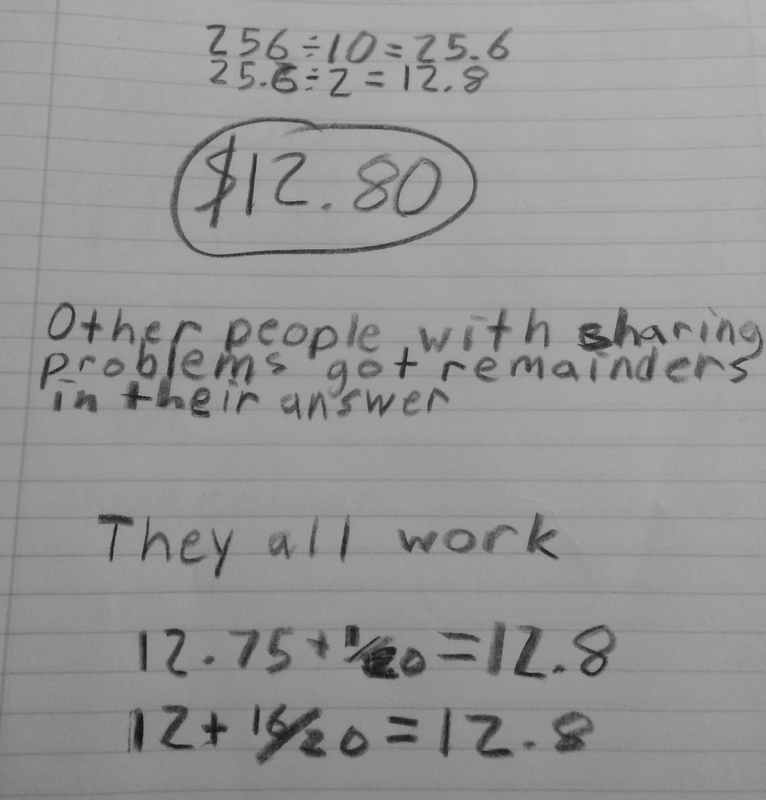 The most perplexing quotient for most of the students was the 12.75 r 1 so I asked the student to write out his thought process because he was having trouble explaining it. And here’s to the remainder of the school year…. 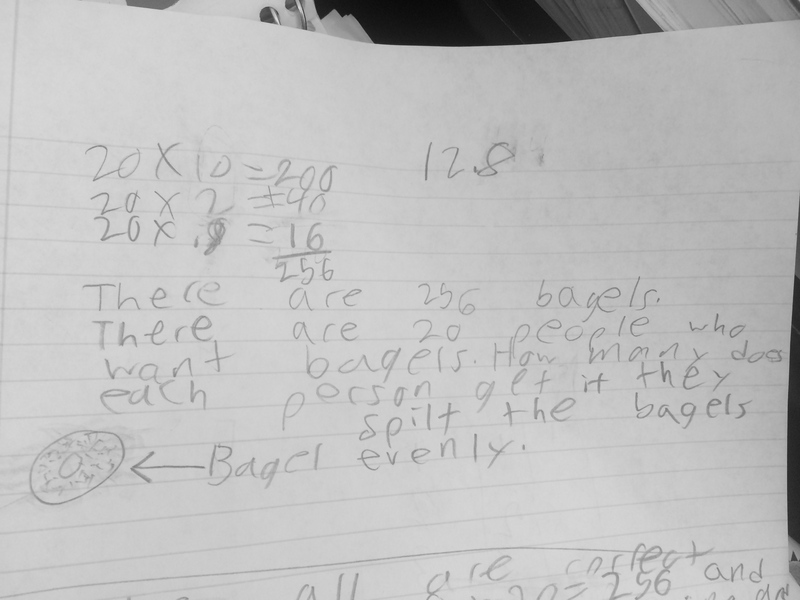 This entry was posted in 5th Grade, Decimal Division, Decimals and tagged decimal, Decimal Division, division on May 18, 2015 by mathmindsblog. Apologize, not much time to write, but today was so cool I had to share! I am in the midst of using this work to better plan for tomorrow. 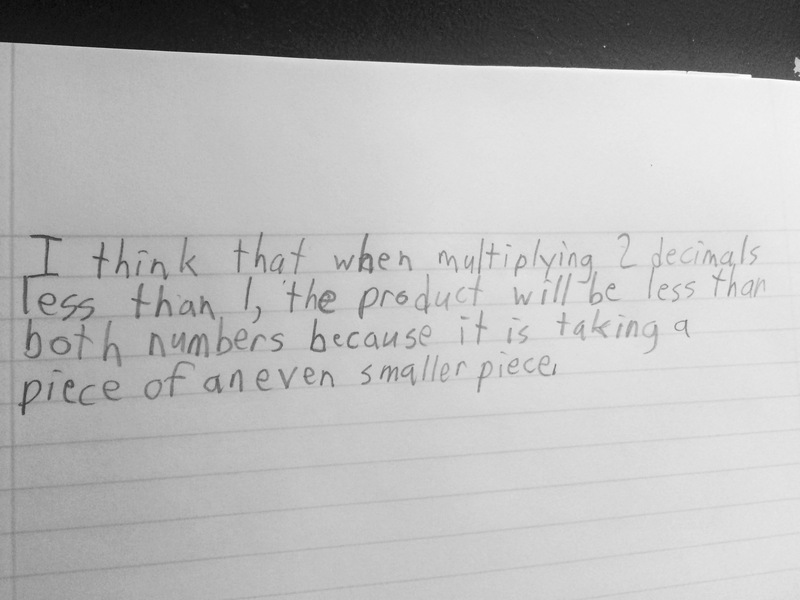 Short version: After our predictions yesterday, I posed 0.4 x 0.2 (I changed the problem to 0.6 x 0.4 for my second class) and asked the students to individually jot down what they thought the answer is. I was looking to see how they intuitively thought about the problem. As expected, I saw 0.8 and 0.08 (2.4 and .24) as I walked around. 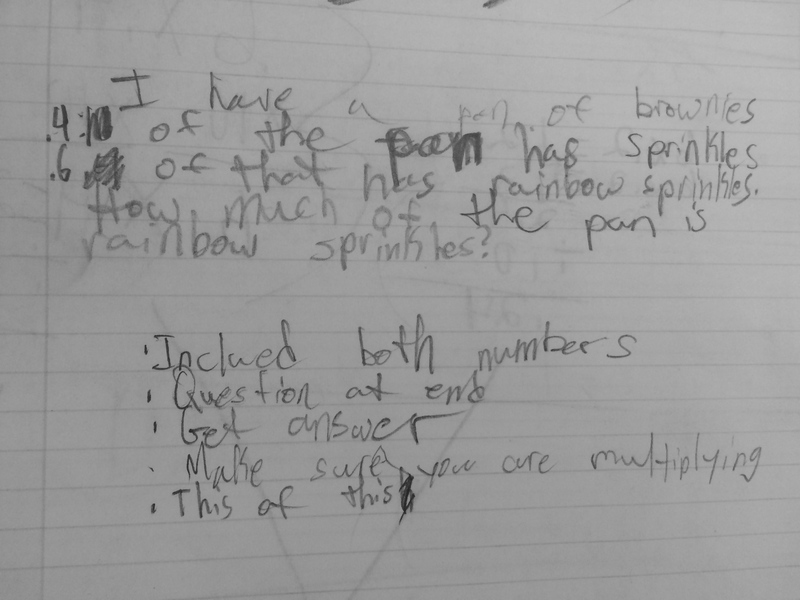 I wrote both answers on the board, asked them to write their reasoning in their journals and then we shared as a class. No telling which was right or wrong, just sharing and listening. Some great thinking and critiquing of each others’ reasoning ensued and then I sent them off to come to a consensus as a table and create a poster of how they thought about it! Now, where to go with this work? They could just look at strategies, but I want them to think deeper about the meaning of the problem. After chatting with my colleague Faith tonight, who is coming to observe tomorrow, we are going to have the students walk around to the other group posters and talk about what they saw on the other posters that changed the way they thought about the problem. 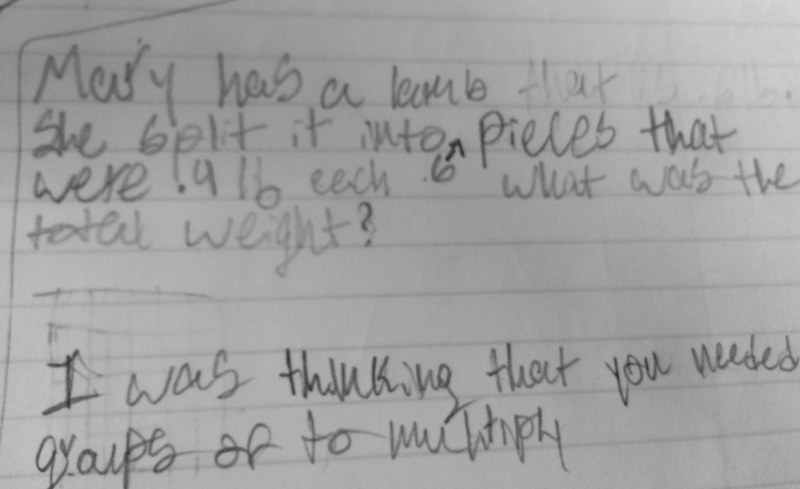 From there, I really wanted them to think about a context for this problem and Faith suggested also thinking about what happens are you begin to adjust the numbers and why….really thinking about the reasonableness of answers. What happens when one factor increases? What happens when one factor goes over a whole? What happens if the factors go into the hundredths? Does the product increase or decrease? Why? So many fun convos to be had tomorrow! 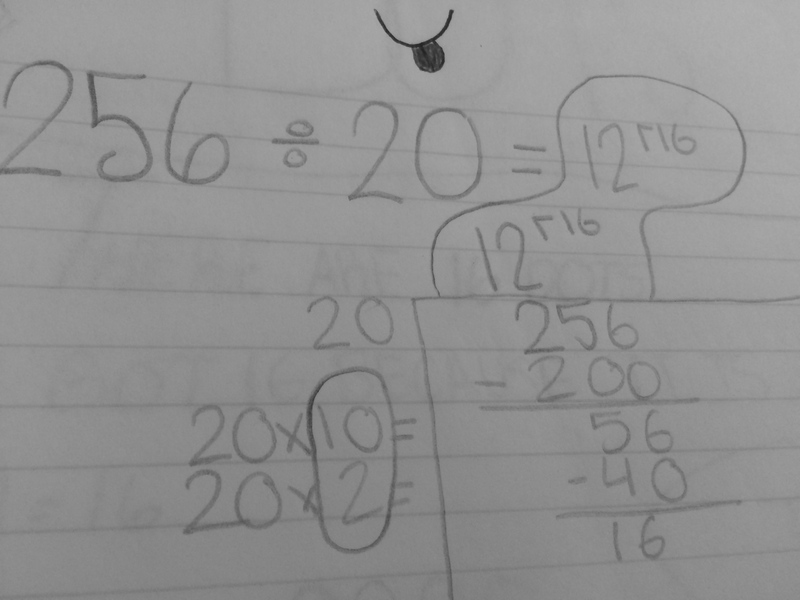 This entry was posted in 5th Grade, Decimals and tagged 5th Grade, decimal, Decimal Multiplication on April 29, 2015 by mathmindsblog. 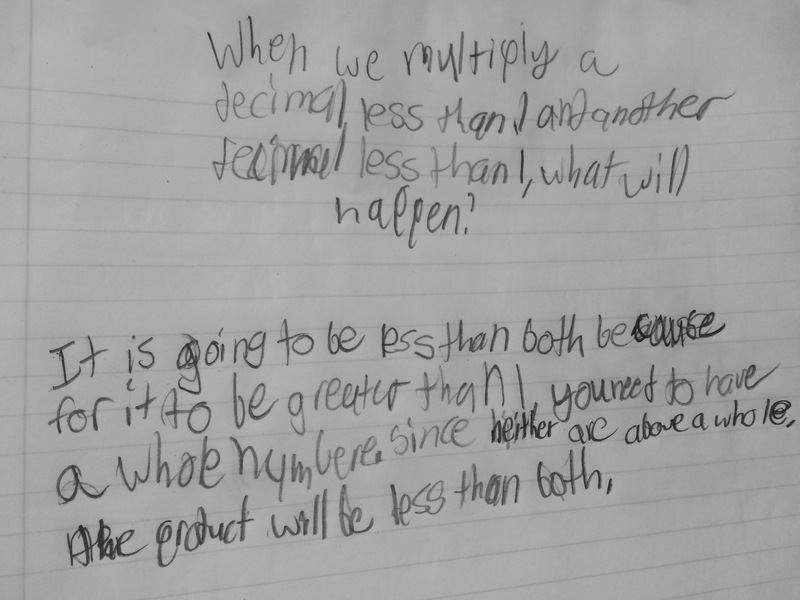 I asked them to prove that a decimal greater than 1 times a whole number will have a product that is greater than both factors OR if a whole number, less than one, times a whole number will have a product that is less than one factor but greater than the other. 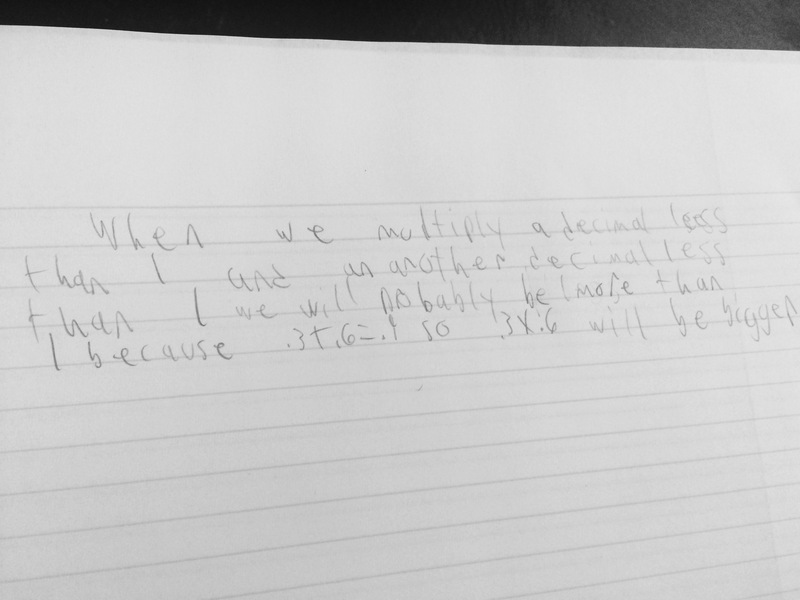 We shared out and ended the class predicting what they think would happen when we multiply two numbers that are less than one. 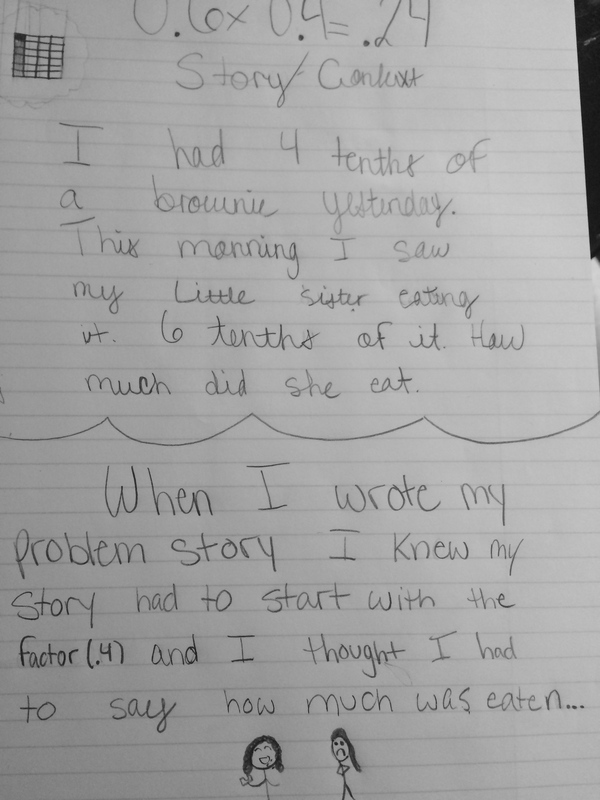 This is where I saw an interesting difference in the way students thought about the problem. 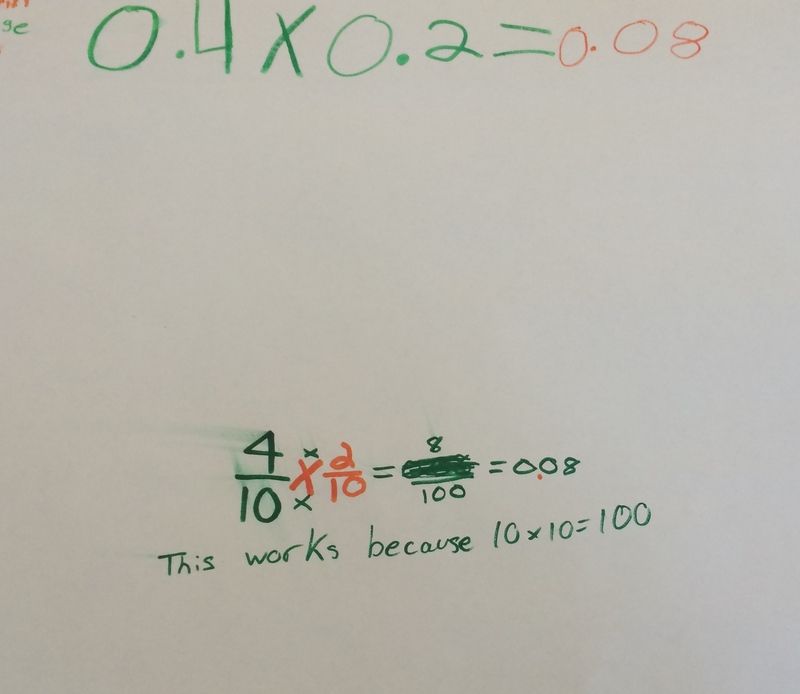 Some focused on the numbers and what it means in an “of” sense, while others connected to what happens with the multiplication process. 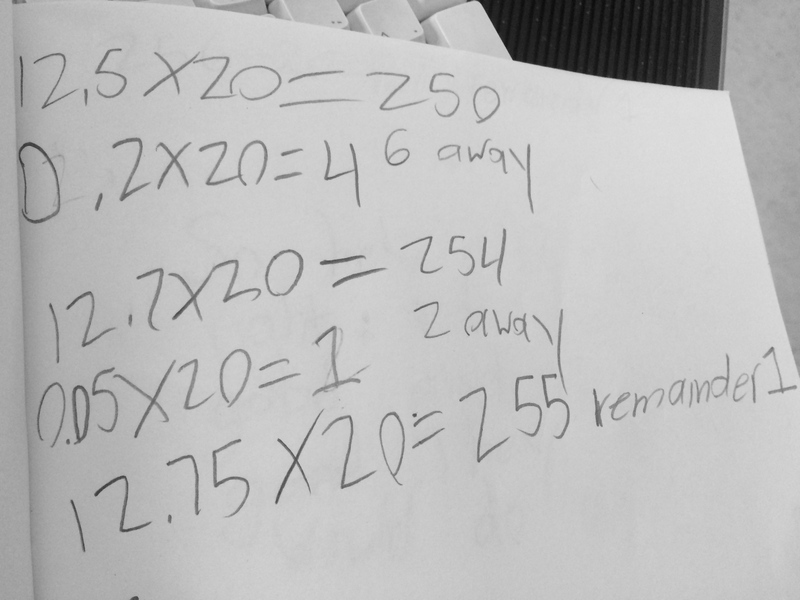 This entry was posted in 5th Grade, Decimals and tagged 5th Grade, Decimal Multiplication on April 27, 2015 by mathmindsblog.